Walla Crag, standing at 1234 feet high, is well worth the climb to the top giving wonderful views of Derwent water, Keswick and surrounding fells. We park in one of the side streets and make our way to the market place in the centre of Keswick and to Moot Hall the tourist information centre and walk forward into St. Johns Street. We pass the George Hotel and head forwards passing Church Street on our left until we come to a sign Manor Brow we turn immediate right into Springs Road. We follow the tarmac road which bends left then right. When we reach Springs Farm we walk over the little foot bridge and bear round to the left and keep to the right of a building and with the stream on our left. We head forward through the gate into Springs Wood. After a short way we come to a footbridge, we do not go over the bridge, but turn right on the path between two walls and then left. We keep following the path on the edge of the wood with open fields to the right and then into the wood with the stream on our left until we come to another footbridge. We go over the footbridge and after a short way we go through a gate and turn right onto the road. We walk on the road for a short way and just before Rakefoot farm we turn right, go over the footbridge turn left and follow the path going slightly uphill. We then go through the gate and follow the path over open ground with a wall on our right towards the trees and a gate. We go through the gate and follow the path slightly to the left, with the trees and Walla Crag edge on our right. 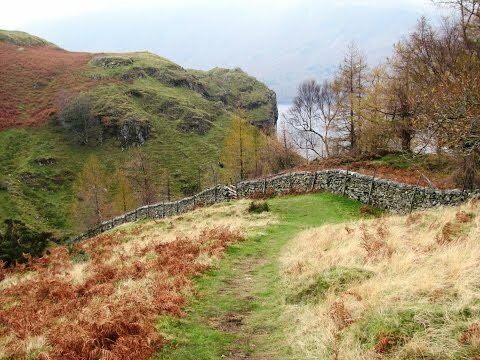 We walk uphill to the top of Walla Crag and then make our way to the stile in the wall. We cross the stile and turn immediate right and follow the wall going downhill. We pass a footpath on the right and keep heading downhill still with the wall on our right. We then go very steeply downhill following Cat Gill and then bearing right into the wood for about ¼ of a mile until we come to a barrier. We go through the barrier and turn left going downhill towards a tarmac track and Derwent Water. At the tarmac track we turn right then at Great Wood car park we turn left towards the main road. We now cross straight over the road go down some steps and head forward through the trees. We then turn right over a footbridge and head forward. When we reach the tarmac track we turn left and after a short way we turn right through a gate and follow the path through the trees until we reach Derwent Water. We now just keep following the path round the edge of the water, after passing a boat house on the left we keep going forward for a short way until we come to the Theatre by the Lake, car park and toilets. We then head into Keswick town centre and back to our car. Approx 5 miles using OS map OL4, The English Lakes North Western Area. Keswick is in the Lake District, Cumbria. From the A66 take the A591 sign posted Keswick then at the t-junction turn right onto the A5271 which will take you into the centre of Keswick. In Keswick there are public toilets in the car park round the back of the market place and at the Theatre by the Lake. For refreshments there are many pubs, a fish and chip shop, a cafe and many shops. For accommodation there are plenty of B&B’s especially in the side streets. Please note: The old stable in our video at Springs Farm has now be converted into a cafe and tea room.